Macroeconomics, econometrics, forecasting economic time series. 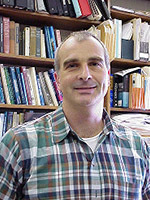 Frederick L. Joutz is a professor in the Department of Economics at The George Washington University. He has taught graduate, undergraduate, and MBA level courses in Econometrics, Forecasting, Macroeconomics, Money and Banking, and Energy Economics, during the last twenty years. The primary focus of his research has been in the areas of economic modeling and forecasting. He contributes quarterly forecasts of nearly 25 U.S. macroeconomic variables to the Federal Reserve Bank of Philadelphia and the Survey of Professional Forecasters (formerly the ASA/NBER Quarterly Outlook) and the Economic Survey International ESI by the CES/IFO Institute. In addition, he has been an associate editor of Energy Economics and the International Journal of Forecasting. He has served as an economic consultant and technical expert to the U.S. Energy Information Administration and several federal government agencies, the IMF, and private corporations. This work has involved writing research reports, conducting market analyses, developing econometric forecasting models, providing technical support, and conducting technical workshops and training sessions.